20 Jan Metrico+ is out now for the Xbox One! METRICO+ is finally out for the Xbox One! Once again a big thanks to the ID@Xbox for helping making this possible. We’re extremely happy with all the positive reviews that people have been giving Metrico+ (we’re currently at a 81 Metacritic). We hope everyone enjoys Metrico+ just as much as the reviewers so far! Metrico+ released on all current platforms now, so it’s time for us to completely move on to the next Digital Dream. Make sure to follow us on Facebook or Twitter to get the latest news on any new project! The Metrico+ Xbox One version will release on January the 20th! A big thanks to ID@Xbox for making this possible. We’re looking forward to hearing all the reactions from Xbox One players on the world we created! 09 Aug FINALLY Metrico+ release date announced and new trailer! We are proud and excited to announce that Metrico+ will come out on the 23rd of August on PlayStation 4, Xbox One, and PC / Mac! Be sure to check out the blog post on the official Playstation blog for more information. Also, be sure to wish list the game on Steam, at: http://store.steampowered.com/app/373990. 15 Jul We’re announcing METRICO+, coming to PS4, Xbox One, and Steam! We’re extremely excited to announce METRICO+! Metrico+ is the remake of Metrico, and will come out on PS4, Xbox One, and PC / Mac / Linux (on Steam). We are very happy with how Metrico got received by players and press when it came out for the PlayStation Vita. Metrico was included in the PlayStation+ line-up at launch, so lots of people played it when it came out on the PlayStation Vita. The PlayStation Vita is a fantastic platform with a great audience, but we would love more people to enjoy the world we created. Players thought the same: Since Metrico’s release for the PlayStation Vita, we’ve had lots of people without a PlayStation Vita asking us if they could also get an opportunity to play the game. 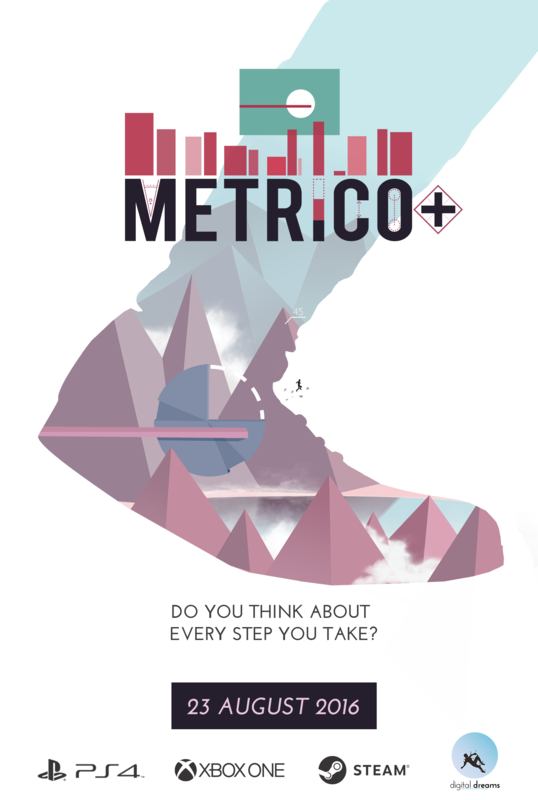 We heard all of you and are thrilled that the Metrico experience will make it’s way to the big screen! Metrico+ features lots of new content and the visuals have been completely revamped for the PC, PS4 and Xbox One. Instead of the worlds that use Vita hardware features, there are completely new unique worlds to explore with new mechanics and puzzles for the player to solve. There are also other interesting changes and additions that we’ll announce at another time. The game will be shown for the first time in August this year at Gamescom in the Indie Arena Booth on the consumer show floor. Just a half year from now, in Q1 2016! Keep up to date on the latest news or contests to win codes by following our Facebook and Twitter pages! 06 Aug Metrico is now out on PS Vita in the US and Europe! Also, Release Trailer! It’s done.. It has actually happened. We worked 1,5 year on Metrico and now it can be played by everybody. There’s a wide variety of reviews and opinions, something we’ve experienced over the past year and is getting amplified right now. We’d love to hear yours when you played the Metrico. Do reach out through Facebook or Twitter and tell us about your experience! We made a new trailer, just for this occasion. The trailer and more details on Metrico’s trophies, the PS+ deal & more is what you’ll find by checking out this new PlayStation Blog post! 24 Jun You can play Metrico right now! .. if you happen to be near our office this week that is.. Chances are that you’ve seen us go in overdrive as of late, and it so happens that all this hard work has improved the game greatly. At least.. that’s we what hope, and that’s where you come in. Literally! This entire week you can come in at any time, while we’re here (which is pretty much always), pick up one of our PS Vita’s and play. It will more useful to us the longer you play, but every bit of feedback will help. We expect you to play at least 30 minutes though, up to several hours when you are up for it. Don’t know where exactly in Utrecht to find us? Then best send roy@digitaldreamsgames.com a mail and he’ll help you out! 16 Sep Metrico on tour: Fantastic Arcade, Indigo & IndieCade are up next! After the response and feedback from Gamescom and PAX, we are ready to show Metrico at more events! We are still in a Pre-Alpha stage, so don’t consider that which you will see to be final, but it should be a good introduction to the game. In Austin, Texas from September 19-22 you will be able to find the game at Sony’s booth. While there is a great line-up including Wasteland Kings, Towerfall, Kentucky Route Zero and The Stanley Parable, please take some time to play Metrico, if you haven’t already. On September the 28th Metrico will be playable in our own hometown, Utrecht, for the first time here in the Netherlands. Come see us and other notable games from Dutch developers and students. In LA, California Metrico will be once more at Sony’s booth during IndieCade between 4-6 October. While there, we also recommend trying out Spin the bottle, Super Time Force and That Dragon, Cancer, assuming you have played most of the other, slightly older, games by then. A very last minute surprise! Metrico will also be playable at the Virgin Media Game Space during the Eurogamer Expo from September 26 to 29. Find us along Doom Piano, Lovers in a Dangerous Space and Lone Survivor. Please let us know what you thought through Facebook or Twitter! We welcome all your feedback. 19 Aug Metrico playable for the first time at Gamescom & PAX and first concept art! We are very glad to finally have Metrico at a point where we can start to show it to you! And so Digital Dreams is going on tour with this first playable. Metrico is currently in a Pre-Alpha stage, but it already reflects what the game is about, and we’d love to get your feedback while we keep working on it. Also, a blog post including new concept art has just gone live on the official Playstation blog. Roy tells a bit about the gameplay mechanics and it also shows concept art. You can check it out over HERE. From the 21st till the 25th of August we will be showing Metrico at Gamescom in Cologne, Germany. Metrico at both Sony’s booth as well as at the Indigo Showcase in the business area. From the 30th of August till the 2nd of September we will be at PAX Prime, Seattle, WA. If you happen to be at either event make sure to look us up and give Metrico a try! 24 May Wanted: Talented interns for Metrico! All of our current internship positions will need fresh new minds starting in September. That means we’re looking for a Motion Graphic Designer, Unity-wise Programmers, a 3d Character Animator, a 2D Concept Artist, and hands-on Marketeers who would like to work with us on Metrico. Would you like to work on this very special game, work passionately on a PlayStation Vita title and see what it is like in a small, informal yet professional team? Then apply! You can find more info on this at our job page. The quicker you contact us, the better! 26 Mar Our new game Metrico announced at GDC San Francisco! Yesterday evening, at a Sony press conference here at GDC San Francisco, we finally revealed our new game “Metrico” To the public. Together with the announcement we released a short teaser that will give you a slight idea as to what the game is like. You can check it out by clicking HERE. Metrico is currently being developed as a PS Vita exclusive. We are very proud and exited to be working together with Sony and their PubFund to make Metrico as awesome as it can be. Stay tuned for more info and let us know what you think.